Celebrate your love of the open waters with our stylish candles that make great anchor wedding favors. 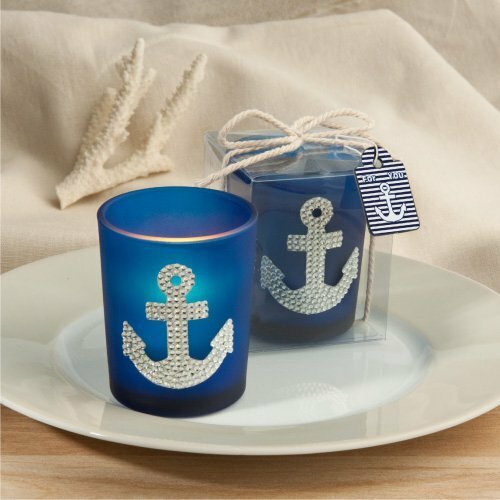 They're brilliantly designed with a deep blue color glass votive holder (white tealight included) that features the perfect amount of clear rhinestone-bling in the shape of an anchor. They're a great favor choice for a destination wedding or any beach, nautical, or sea themed event. They arrive in a clear box with a rope designed ribbon and an attached "For You" tag. Each measures 2 1/2" x 2". This is the Spectacular Anchor Candle Wedding Favors by Fashioncraft. It comes in a plastic box with a very lovely rope to tie it all together and a little tag that says, 'For You', with a cute little emblem of the anchor on there. Let's open this up and see what's inside. So, immediately you can see the beautiful attention to detail with the rhinestones making up the anchor. Your guests will very much appreciate you thinking of every detail of your wedding favor. And inside is a little tea candle. It's made of very thick glass, as you can tell. Lovely blue. It's a perfect wedding favor for that nautical beach theme or even tropical-themed wedding, and perfect for your guests.